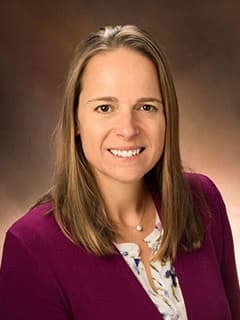 Heather H. Burris, MD, is an attending neonatologist at CHOP Newborn Care at the Hospital of the University of Pennsylvania and Children's Hospital of Philadelphia. Burris HH, Baccarelli AA: Air pollution and in-utero programming of poor fetal growth. Epigenomics 9(3): 213-216, Mar 2017 Notes: DOI: 10.2217/epi-2017-0008. Rodosthenous RS, Burris HH, Svensson K, Amarasiriwardena CJ, Cantoral A, Schnaas L, Mercado-García A, Coull BA, Wright RO, Téllez-Rojo MM, Baccarelli AA. Environ Int. 2016 Dec 5. pii: S0160-4120(16)30894-7. doi: 10.1016/j.envint.2016.11.023. [Epub ahead of print]. : Prenatal lead exposure and fetal growth: Smaller infants have heightened susceptibility. Environ Int 99: 228-233, Feb 2017. Sanders AP, Gennings C, Svensson K, Motta V, Mercado-Garcia A, Solano M, Baccarelli AA, Téllez-Rojo MM, Wright RO, Burris HH: Bacterial and cytokine mixtures predict the length of gestation and are associated with miRNA expression in the cervix. Epigenomics 9(1): 33-45, Jan 2017. Renzetti S, Just AC, Burris HH, Oken E, Chitra A, Svensson K; Mercado-García A, Cantoral A, Schnaas L, Baccarelli AA, Wright RO, Téllez-Rojo MM. T. . 2016. In press: The association of lead exposure during pregnancy and childhood anthropometry in the Mexican PROGRESS cohort. Environ Res 152: 226-232, Jan 2017 Notes: DOI: 10.1016/j.envres.2016.10.014. Haviland MJ, Shainker SA, Hacker MR, Burris HH: Racial and ethnic disparities in universal cervical length screening with transvaginal ultrasound. Journal of Maternal-Fetal and Neonatal Medicine 29(24): 4078-4081, Dec 2016 Notes: DOI: 10.3109/14767058.2016.1157577. Agha G, Hajj H, Rifas-Shiman SL, Just AC, Hivert M, Burris HH, Lin X, Litonjua AA, Oken E, DeMeo DL, Gillman MW, Baccarelli AA. Birth weight-for-gestational age is associated with dna methylation at birth and in childhoodBirth Weight-for-Gestational Age is Associated with DNA Methylation at Birth and in Childhood. Clin Epigenetics. 2016 Nov 16;8:118: Birth weight-for-gestational age is associated with dna methylation at birth and in childhood. Clin Epigenetics 8: 118, eCollection 2016, Nov 2016 Notes: DOI: 10.1186/s13148-016-0285-3. Joung KE, Burris HH, Van Marter LJ, McElrath TF, Michael Z, Tabatabai P, Litonjua AA, Weiss ST, Christou H: Vitamin D and Bronchopulmonary Dysplasia in Preterm Infants. J Perinatol 3610: 878-882, Oct 2016 Notes: DOI: 10.1038/jp.2016.115. Lin VW, Baccarelli AA, Burris HH: Epigenetics-a potential mediator between air pollution and preterm birth. Environ Epigenet 20(1), Jan 2016 Notes: DOI: 10.1093/eep/dvv008. Burris HH, Baccarelli AA, Wright RO, Wright RJ: Epigenetics, linking social and environmental exposures to preterm birth. Pediatr Res 79(1-2): 136-140, Jan 2016 Notes: DOI: 10.1038/pr.2015.191. Sanders AP, Burris HH*, Just AC, Motta V, Amarasiriwardena C, Svensson K, Oken E, Solano-Gonzalez M, Mercado-Garcia A, Pantic I, Schwartz J, Tellez-Rojo MM, Baccarelli AA, Wright RO. A. Epigenomics. 2015 Sep 29. [Epub ahead of print] PMID: 26418635. *Co-first author: Altered miRNA expression in the cervix during pregnancy associated with lead and mercury exposure. Epigenomics 7(6): 885-889, 2015 Notes: DOI: 10.2217/epi.15.54. Sanders A & Burris HH*, Just AC, Motta V4, Svensson K, Mercado-Garcia A, Pantic I, Schwartz J, Tellez-Rojo MM, Wright RO, and Baccarelli AA (*Co-first author): MicroRNA expression in the cervix during pregnancy is associated with length of gestation. Epigenetics 10(3): 221-228, 2015 Notes: DOI: 10.1080/15592294.2015.1006498. Paydar-Darian N, Pursley D, Haviland M, Mao WY, Golen T, Burris HH: Improvement in Perinatal HIV Status Documentation in a Massachusetts Birth Hospital, 2009-2013, Quality Report. Pediatrics 136(1): e234-241, Ju; 2015 Notes: DOI: 10.1542/peds.2014-3849. Burris HH, Baccarelli AA, Byung HM, Cantoral A, Just AC, Pantic I, Solano-Gonzalez M, Svensson K, Tamayo y Ortiz M, Zhao Y, Wright RO and Téllez-Rojo MM: Offspring DNA methylation of the aryl-hydrocarbon receptor repressor (AHRR) is associated with maternal BMI, gestational age and birth weight. Epigenetics 10(10): 913-921, 2015 Notes: DOI: 10.1080/15592294.2015.1078963. Yamamoto A, McCormick MC, Burris HH: Disparities in antidepressant use in pregnancy. J Perinatol 35(4): 246-255, Apr 2015 Notes: DOI: 10.1038/jp.2014.197. Burris HH, Thomas A, Zera CA, McElrath TF: Prenatal vitamin use and vitamin D status during pregnancy, differences by race and overweight status. J Perinatol 35(4): 241-245, Apr 2015 Notes: DOI: 10.1038/jp.2014.198. Oken E, Baccarelli AA, Gold DR, Kleinman KP, Litonjua AA, De Meo D, Rich-Edwards JW, Rifas-Shiman SL, Sagiv S, Taveras EM, Weiss ST, Belfort MB, Burris HH, Camargo CA, Huh SY, Mantzoros C, Parker MG, Gillman MW: Cohort profile: project viva. Int J Epidemiol 44(1): 37-48, Feb 2015 Notes: DOI: 10.1093/ije/dyu008. Yamamoto A, McCormick MC, Burris HH: US provider-reported diet and physical activity counseling to pregnant and non-pregnant women of childbearing age during preventive care visits. Matern Child Health J 18(7): 1610-1618, Sep 2014 Notes: DOI: 10.1007/s10995-013-1401-z. Burris HH, Camargo CA Jr: Time for large randomised trials of vitamin D for women with gestational diabetes mellitus to improve perinatal health outcomes. Diabetologia 57(9): 1746-1748, Sep 2014 Notes: DOI: 10.1007/s00125-014-3314-9. Burris HH, Baccarelli AA, Motta V, Byun HM, Just AC, Mercado-Garcia A, Schwartz J, Svensson K, Téllez-Rojo MM, Wright RO: Association between length of gestation and cervical DNA methylation of PTGER2 and LINE 1-HS. Epigenetics 9(8): 1083-1091, Aug 2014 Notes: DOI: 10.4161/epi.29170. Burris HH, Rifas-Shiman SL, Huh SY, Kleinman K, Litonjua AA, Oken E, Rich-Edwards JW, Camargo CA, Gillman MW: Vitamin D status and hypertensive disorders in pregnancy. Ann Epidemiol 24(5): 399-401.e1, May 2014 Notes: DOI: 10.1016/j.annepidem.2014.02.001. Burris HH, Baccarelli AA: Environmental epigenetics: from novelty to scientific discipline. J Appl Toxicol 34(2): 113-116, Feb 2014 Notes: DOI: 10.1002/jat.2904. Burris HH, Van Marter LJ, McElrath TF, Tabatabai P, Litonjua AA, Weiss ST, Christou H: Vitamin D status among preterm and full term infants at birth. Pediatr Res 75(1-1): 75-80, Jan 2014 Notes: DOI: 10.1038/pr.2013.174. Burris HH, Braun JM, Byun H, Tarantini L, Mercado A, Wright RJ, Schnaas L, Baccarelli AA, Wright RO, Tellez-Rojo MM: Associations of birthweight and DNA methylation of IGF2, glucocorticoid receptor and repetitive elements LINE-1 & Alu. Epigenomics 5(3): 271-281, 2013 Notes: DOI: 10.2217/epi.13.24. Burris HH, Rifas-Shiman SL, Kleinman K, Ligonjua AA, Huh SY, Rich-Edwards JW, Camargo CA Jr, Gillman MW: Vitamin D deficiency in pregnancy and gestational diabetes mellitus. Am J Obstet Gynecol 207(3): 182.e1-8, Sep 2012 Notes: DOI: 10.1016/j.ajog.2012.05.022. Burris HH, Rifas-Shiman SL, Camargo CA Jr, Litonjua AA, Huh SY, Rich-Edwards JW, Gillman MW: Plasma 25-hydroxyvitamin D during pregnancy and small-for-gestational age in black and white infants. Ann Epidemiol 22(8): 581-586, Aug 2012 Notes: Doi: 10.1016/j.annepidem.2012.04.015. Burris HH, Rifas-Shiman SL, Baccarelli A, Tarantini L, Boeke CE, Kleinman K, Litonjua AA, Rich-Edwards JW, Gillman MW: Associations of long interspersed nuclear element-1 DNA methylation with preterm birth in a prospective cohort study. J Dev Orig Health Dis 3(3): 173-181, Jun 2012 Notes: DOI:10.1017S2040174412000104. Boeke CE, Baccarelli A, Kleinman KP, Burris HH, Litonjua AA, Rifas-Shiman SL, Tarantini L, Gillman MW: Gestational intake of methyl donors and global LINE-1 DNA methylation in maternal and cord blood: prospective results from a folate-replete population. Epigenetics 7(3): 253-260, Mar 2012 Notes: DOI: 10.4161/epi.7.3.19082. Burris HH, Werler MM: U.S. provider reported folic acid or multivitamin ordering for non-pregnant women of childbearing age: NAMCS and NHAMCS, 2005-2006. Matern Child Health J 15(3): 352-359, Apr 2011 Notes: DOI: 10.1007/s10995-010-0587-6. Burris HH, Mitchell AA, Werler MM: Periconceptional Multivitamin Use and Infant Birth Weight Disparities. Ann Epidemiol 20(3): 233-240, Mar 2010 Notes: doi: 10.1016/j.annepidem.2009.12.003. Burris HH, Collins JW: Race and preterm birth; the case for epigenetic inquiry. Ethn Dis. 20(3): 296-299, 2010 (Summer). Aslam M, Burris HH, Zupancic JA: Are we satisfied with the way we review an article? Adv Neonatal Care 9(1): 40-42, 2009. Gerson KD, Hacker MR, Haviland MJ, Ralston SJ, Burris HH: Resilience in Pregnancy: Impact on Maternal and Neonatal Outcomes. Platform presentation by colleague, the New England Perinatal Society annual meeting, Newport, RI 2017. Neo DT, Nuss E, Hacker MR, Burris HH: Selective serotonin reuptake inhibitor (SSRI) use in pregnancy and neonatal therapeutic hypothermia for suspected hypoxic ischemic encephalopathy (HIE). Poster presentation Society for Epidemiologic Research annual meeting, Seattle, WA, Jun 2017. Haviland MJ, Burris HH, Hacker MR: The effect of maternal resilience on the association of depression and high anxiety with preterm birth. Poster presentation, Society for Epidemiologic Research annual meeting, Seattle, WA Jun 2017. Barrero-Castillero A, Mao W, David Miedema D, Pursley DM, Burris HH. G : Glucose concentrations in the Neonatal Intensive Care Unit: Are they in line with national guidelines? Platform presentation by colleague, Pediatric Academic Societies Meeting, San Francisco, CA May 2017. Kennedy EB, Hacker MR, Ada M, Golen T, Miedema D, Pursley DM, Burris HH: NICU admissions after a policy to reduce elective deliveries before 39 weeks. Platform presentation by colleague, New England Perinatal Society annual meeting, Newport, RI 2016. Ada ML, Hacker MR, Shainker SA, Haviland MJ, Burris HH. . Presented as an oral : Trends in medically-indicated vs. spontaneous preterm birth, 2004-2013. Platform presentation by colleague, the New England Perinatal Society annual meeting, Newport, RI 2015. Fanaroff et al: Yearbook of Neonatal and Perinatal Medicine 2016. Yearbook of Neonatal and Perinatal Medicine Series. Elsevier Mosby, Philadelphia, PA, 2016 Notes: Contributing Editor. Fanaroff et al: Yearbook of Neonatal and Perinatal Medicine 2015. Yearbook of Neonatal and Perinatal Medicine Series. Elsevier Mosby, Philadelphia, PA, 2015 Notes: Contributing Editor. Fanaroff et al: Yearbook of Neonatal and Perinatal Medicine 2014. Yearbook of Neonatal and Perinatal Medicine Series. Elsevier Mosby. Philadelphia, pA, 2014 Notes: Contributing Editor. Fanaroff et al: Yearbook of Neonatal and Perinatal Medicine 2013. Yearbook of Neonatal and Perinatal Medicine Series. Elsevier Mosby, Philadelphia, PA, 2013 Notes: Contributing Editor. Burris HH: Hypoglycemia and Hyperglycemia. Cloherty and Stark's Manual of Neonatal Care, 8th edition, Clinical reference for practicing physicians in the neonatal intensive care unit. Used domestically and internationally. Hansen AR, Eichenwald EC, Stark AR, Martin CR (eds.). Lippincott Williams & Wilkins, 2017. Burris HH. Considering Epigenetics As A Link Between Society And Birth Outcome Disparities. Presented at: Boston University School of Public Health Reproductive Epidemiology Conference; 2017 Apr; Boston, MA. Burris HH. Perinatal Epigenetics: Epigenetics Concepts and Potential Clinical Implications. Presented at: Global Pediatrics, Distributed by Harvard Medical School; 2017 Jan; Boston, MA. Burris HH. Perinatal Epigenetics, Linking Society to Birth Outcomes. Presented at: Neonatal Research Conference, Children's Hospital of Philadelphia; 2016 Jan; Philadelphia, PA.
Burris HH. Cervical microRNA as Potential Biomarkers for Spontaneous Preterm Birth. Presented at: Perinatal Research Conference, University of Colorado; 2016 Nov; Denver, CO.
Burris HH. Perinatal Epigenetics, Linking Social and Environmental Exposures to Birth Outcomes. Presented at: Neonatal Noon Conference, University of Colorado; 2016 Nov; Denver, CO.
Burris HH. Perinatal Health Research; Side Projects and Favorite Methods. Presented at: Neonatal Outcomes Research Activities (NORA), University of Colorado; 2016 Nov; Denver, CO.
Burris HH. Perinatal Epigenetics: New Approaches to Understanding Preterm Birth. Presented at: New England Association of Neonatal Nurses; 2016 Sep; Marlborough, MA. Burris HH. Epigenome de Cervix, Medio Ambiente y Parto Pretermino. Presented to: Sesion de Investigacion, National Institute of Perinatology; 2016 Sep; Mexico City. Burris HH. Perinatal Epigenetics, Linking the Environment to Preterm Birth. Presented at: Society for Pediatric Research Presidential Plenary, New Outstanding Member Science Lecture, Pediatric Academic Societies Meeting; 2016 May; Baltimore, MD.